The little statue thing is a blatant violation of copyrights, yes. I agree with that. However, then you went off on a tangent and said that Alan Moore, Todd McFarlane and all those others were thieves for using Marvelman/Miracleman because it belonged to Anglo or whatever. 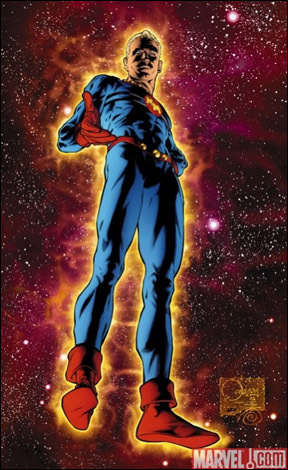 But Marvelman/Miracleman is a blatant copyrights violation himself, so your point about thievery is moot. the whole concept itself was already stolen. The VISUAL design is as far away from any superhero as the next and that's where the theft lies. Oh for the love of god cut it out. I cannot for the life of me even begin to comprehend how someone claiming to be a lawyer can be so incredibly dense. Man, you are a real piece of work! There is an abundance of superheroes, before and after the 1950s, in the MM mold. In US copyright, "protectable elements" has very specific meaning and contexts -- it'll be fascinating to see how this plays out, though truth to tell, we'll probably never know. Most legal proceedings over such issues end up settling out of court, and well out of public view, with binding non-disclosure agreements ensuring it all remains out of public view. One of my favourite movies of all time is John Stuges' THE MAGNIFICENT SEVEN, and one of the best scenes in it is when Chico, having been previously humiliated by Chris, bursts into the bar where the gunmen are talking. He starts off drunk and rambling and gets more unstable as the scene goes on, and the experienced gunmen pretty much just ignore him, knowing he lacks the guts to actually shoot Chris in cold blood, and lacks the skill to actually take any of them in a fair shoot-out. Horst Buchholz acts the hell out of that scene. Hey, Mr. Bissette- From now on, ya have to log-in to post. There's no more guest posting at this forum. Sorry about that. Thanks, Al -- no problem, happy to do it. This makes life easier. If I'm reading you correctly, (a) you are relying on this venue to try to 'reach' Neil Gaiman; (b) you are presenting yourself as a legal representative of an unnamed second party, but (c) you seem to be saying if Neil chooses to respond (why he would otherwise, I wouldn't know) via a legal representative, he's somehow "in trouble" (my paraphrasing; I haven't the time to go back and check your precise wording) -- which, of course, he should do, especially given (d) what are essentially threats you've publicly posted here. Your logic defies rational analysis on any number of levels -- though I concede none of this necessarily undermines your claim that this mysterious third party movie producer has legal propriety over the MM characters, concepts and trademarks. I am most curious to know more; as I said, there certainly are historic precedents. Strange to see the comics industry treatment of freelancers prior to the 1990s (when freelancers having legal representation was considered problematic and reason enough to not deal with them, with the notable exception of Mike Friedrich's clients) is alive and well in 2006. 'The Truth' has (hopefully) gone Buh-Bye. Well, with all the crazy contracts that I've come across and had to sign, it's always good to have a lawyer on hand. Now, it seems more accepted for freelancers and creators to have lawyers... especially when Hollywood has a tendency to come over to recruit people from our industry. It is a horrible thought to picture a publisher frowning on a freelancer seeking legal counsel for any contract he/she, might want to sign with said publisher. Re: Sim on Todd's "Man of Miracles"
This is an intersting bit of news: "Marvel’s Marvelman...?". "Neil Gaiman and Todd McFarlane settle..."